One of the most important aspects of construction is delivering a quality project. Owners hire contractors to perform a specific function, and they expect a superior product. 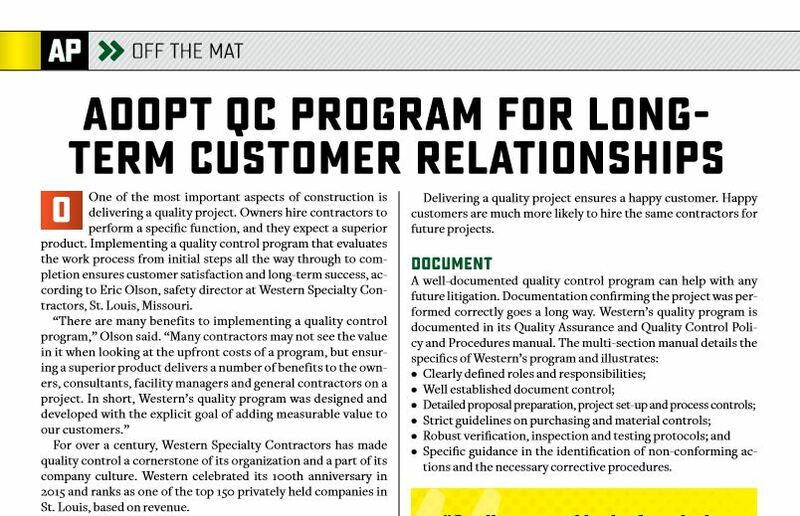 Implementing a quality control program that evaluates the work process from initial steps all the way through to completion ensures customer satisfaction and long-term success, according to Eric Olson, safety director at Western Specialty Contractors, St. Louis, Missouri. For over a century, Western Specialty Contractors has made quality control a cornerstone of its organization and a part of its company culture. Western celebrated its 100th anniversary in 2015 and ranks as one of the top 150 privately held companies in St. Louis, based on revenue. Olson suggested that when implementing a new quality control program, all employees should be fully trained on the value of the program and understand how to perform and document inspections correctly. “If employees aren’t aware or don’t understand the value, they may just see the program as more paperwork and will not truly verify the quality of the performed work,” Olson said. With a sustainable quality control system in place, the tangible benefits to construction companies include reducing risk. Contractors who complete work the right way, the first time, save time and money on expensive re-work. Tearing out and re-installing defective material is almost always more expensive than the initial task. Then, being forced to redo work increases employee risk. Doing a project the first time comes with injury risk, but that risk is tempered through earnings potential. All work should be completed as safely as possible. Performing the same work a second time for free increases employee exposures for little to no gain. Delivering a quality project ensures a happy customer. Happy customers are much more likely to hire the same contractors for future projects. • Specific guidance in the identification of non-conforming actions and the necessary corrective procedures. • A complete set of all documents required for the proper execution of work to be maintained on site. For more information, visit Western Specialty Contractors here.